How to earn Crafting Metals and what they're used for in Apex Legends. In Apex Legends, players have the opportunity to earn various resources including Crafting Metals. 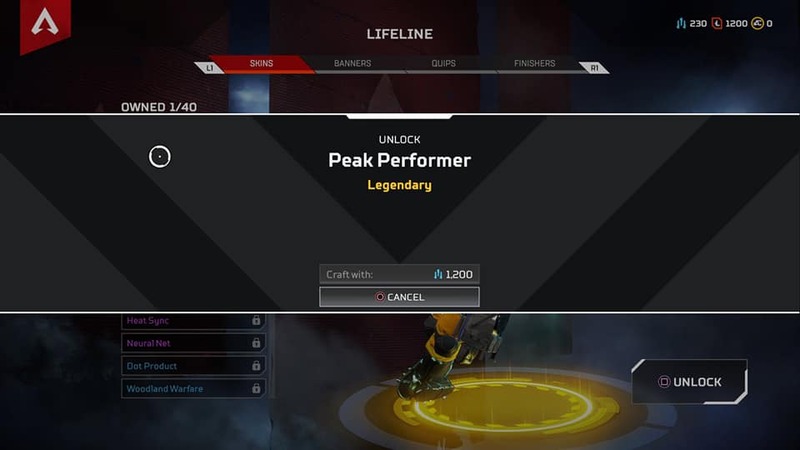 With a high emphasis on customization in Apex Legends, Crafting Metals can be used to make an original loadout full of unique character and weapons skins, as well as Banners, Quips, and Trackers. Wondering how to earn Crafting Metals, or have a surplus of Crafting Metals that you’re not sure what to do with? We’ve got you covered! Below, we’ve put together a quick guide on how to earn Crafting Metals, and what to do with Crafting Metals once you have them in Apex Legends. You can earn Crafting Metals by leveling up and opening Apex Packs in Apex Legends. The first question players have in regards to Crafting Metals is how to earn them in Apex Legends. To earn Crafting Metals, you’ll want to acquire Apex Packs, and the easiest way to get Apex Packs is by playing the game and leveling up. For each new level reached, you’ll earn 1 Apex Pack. 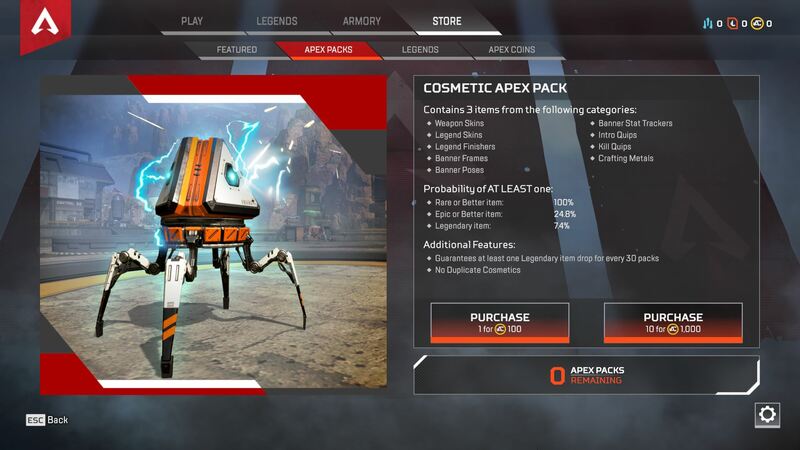 To open your Apex Pack, tab over to the Store in Apex Legends, then select Apex Packs. At the bottom right underneath the option to purchase Apex Packs, you’ll be able to view the number of Apex Packs you have available. For example, if you have 1 Apex Pack, you can select this tab to open your Apex Pack and see what’s inside. Not only can you unlock new cosmetics in Apex Packs, but Crafting Metals as well. In the future, it’s possible that Crafting Metal rewards will be included in the seasonal Battle Pass for Apex Legends, though no confirmation on this has been released by Respawn Entertainment. Crafting Metals can be used to purchase cosmetic items in Apex Legends. Crafting Metals can be used to immediately unlock new cosmetic items such as Legend skins, Banners, Quips, Trackers, and Finishers. To view how many Crafting Metals you have available, look at the upper right corner of your home screen. There, you can see how many Crafting Metals, Legend Tokens, and Apex Coins you have at your disposal. To purchase cosmetic items using Crafting Metals, head over to the Legends or Armory tab. In the Legends tab, you can select your favorite character like Lifeline or Wraith, then view the skins available. If you like a particular skin, you can select it and exchange Crafting Metals in order to purchase it. Likewise in the Armory tab, you can select your favorite weapon, then view the skins available for that weapon. Most, if not all of the items in Apex Legends, are similarly priced with the cost varying depending on rarity. Below, we’ve listed the prices for cosmetic items based on rarity. To recap, Crafting Metals are a form of currency in Apex Legends that can be used to purchase cosmetic items. To earn Crafting Metals, you’ll want to level up and earn Apex Packs. The more Crafting Metals you have available, the rarer the cosmetic item you’ll be able to purchase. Now that you know what Crafting Metals are for and how to earn them, what are your thoughts? Do you like being able to purchase cosmetic items using Crafting Metals, or are you uninterested in collecting skins in Apex Legends? Let us know down in the comments below! For more on Apex Legends, be sure to check out some of our previous guides including whether Apex Legends has a Battle Pass, whether you can play single player in Apex Legends, and how to use a finisher in Apex Legends.